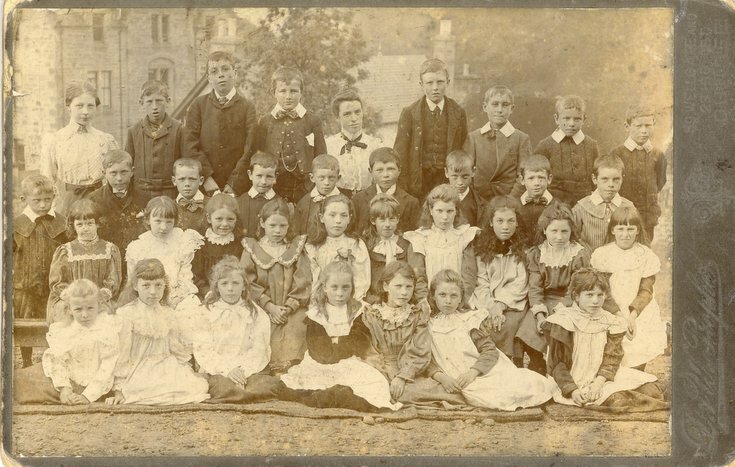 Monochorome school group photograph with teacher middle row back identified at Miss Macallan. There may be some of the same children as shown in picture #992 (Catalogue No. 2002.012) but older (Kenny Macgregor - boy third left back row same as boy third from right back row in 2002. 012; Jock ? -boy third from right back row same as fourth from right back row in 2002.12 etc). The earlier photograph has been dated as 1906 which would make the date of this photograph c 1910. Given the roof level background this photograph appears to have been taken in front of the old school building on School Hill. (This corresponds with 2002.012 which was taken at the side of the same building.) The three storey building in the background on the left is the Sutherland Arms Hotel destroyed by fire in 1941 (see picture #1636 which clearly shows a matching view of the northern side of the hotel building).